Imagine spending thousands of dollars and countless man-hours to machine a component for the medical industry only to end up with a sloppy weld. Most shops can’t afford that kind of mistake and given the exacting standards of the medical industry companies will have to be willing to dedicate time and money to these types of projects. 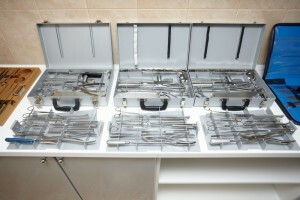 However, at EB Industries we have the expertise to meet the many unique requirements of the medical industry. Since many of the components welded for the medical industry will be used inside the body, either as a surgical tool or an implantable device, these parts must be of the highest quality, and the medical industry will also demand that only certain metals may be used. Since laser beam welding uses a small and precise beam of light, it can join together small and thin materials typical of medical components such as stents and surgical instruments. In addition to the dimensional considerations, there is also an aesthetic component to medical welding. Oftentimes these parts need to be aesthetically pleasing to the end-user, whether it is a surgeon or a patient; the user will not want an ugly device with visible welds. Whereas hand weld parts may show the weld, our engineers can develop a low profile weld that is hardly visible meaning that doctors and patients alike can have a durable and cosmetically pleasing part. Laser beam welding is a non-contact, high power density welding process which uses the energy emanating from a laser beam to join materials together. Benefits of continuous laser beam welding include a deep weld penetration that can be closely controlled by our engineers. Additionally, laser beam welding has a high feed rate (up to 200 inches per minute) making it more cost efficient than MIG and TIG welding. The pulsed lasers can also minimize the amount of heat applied to apart which means post-processing is not necessary. At EB Industries we understand the important requirements of the medical industry and have created a variety of parts and components, including bayonet forceps, drill guides, lumbar inferior endplates, tibial alignment handles, and more. To find out more about our laser beam welding capabilities or to view our parts showcase, visit our website.